KBShimmer Launches “Men are from Mars-ala”! Celebrate the New Year and Pantone’s 2015 Color of the Year with KBShimmer! “Men are from Mars-ala” is an earthy, red-brown shade that will make a fresh new addition to any neutral nail palette. 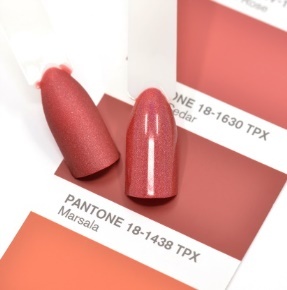 Worn outdoors or in bright light, Men are from Mars-ala features a linear holographic and when indoors, this shade is rich and warm – just like a glass of Marsala wine should be! Men are from Mars-ala’s luxurious formula applies like a dream and dries to a shiny, holographic finish. Wear it with a matte top coat for an ultra-modern look or a high-shine one for something a little more classic. Just make sure you don’t get caught without this year’s Color of the Year! Men are from Mars-ala launches January 1st, 2015 and will be available on www.KBShimmer.com for $8.75. KBShimmer was founded in 2008 by the husband and wife team of Jason and Christy Rose. KBShimmer offers unique and colorful nail glitter nail polishes that are Big 3 Free, with all glitter formulas being completely free of chemicals such as toluene, form aldehyde, form aldehyde resin and dibutyl phthalate (DBP). KBShimmer glitter polishes feature a flat glitter-grabbing brush for easy application.. KBShimmer also offers a 2-free quick dry polish topcoat, olive oil lotion, sugar scrubs, lip balms, cold process soaps, and other skin care products. If you would like more information about KBShimmer, contact Christy Rose by emailing sales@kbshimmer.com or visiting www.KBShimmer.com.